Did you know that producing steel from recycled material consumes 75% less energy than producing virgin steel? So if you are a manufacturer of steel, and you choose to make steel from recycled material, your production cost goes down. If you pass that lower cost on to your customers, who then use that steel to make stuff that you and I, as end consumers, buy, then clearly, we’ve saved ourselves some money. Similarly, the use of cullet (ground recycled glass) reduces the energy costs associated with glass manufacturing. It is estimated that adding 10% cullet to the mix allows the furnace to operate at around 1425 degrees Celsius instead of around 1535 degrees Celsius. This translates not only to lower fuel costs for heating the furnace, but also increases the useful life of the furnace. And if you’re still not convinced about the benefits of recycling glass, maybe this will change your mind - it takes glass 4000 years to be degraded in a landfill; the same glass can be recycled almost indefinitely. In the case of paper too, it is believed that the cost of producing paper from recycled paper is 28% lower (some claim the savings are even greater) than the cost of producing virgin paper. Of course, the relative economics depends on various factors such as grade of paper produced, type of paper mill and what energy it uses, how much it costs to transport the recycled paper to the mill and so on. But it’s fair to assert that recycling paper leads to economic savings and not just environmental savings. The obvious environmental benefit of recycling paper comes from not having to cut so many trees in Scandinavia or the Amazon forests. 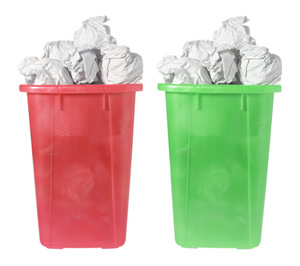 A less intuitive benefit occurs in the form of reduced methane emissions from landfills with paper waste. In turn, this helps slow down the rate at which the hole in the earth’s ozone layer is becoming bigger. Here’s some more food for thought. If we consume less energy, our utilities will logically need to produce less of it. So the amount of coal, gas or oil they need to burn goes down. If the oil or gas used to produce energy is imported, then only smaller quantities need to be imported. That should translate to a lower import bill, in turn helping to restore our balance of trade. When utilities buy less oil, prices too should decline, leading to a virtuous cycle. Of course, this simplistic view assumes that countries like China won’t opportunistically increase their consumption and hence, their imports. But in a globalised world, there are far too many interdependencies and imponderables that drive demand, supply and price equilibrium to be able to predict the future with any reasonable degree of confidence.